For fishes that are not benthic, maintaining vertical position in the water column has the potential for being energetically expensive. For fishes that are not benthic, maintaining vertical position in the water column has the potential for being energetically expensive. This is not the case for most teleost`s, however, because of their ability to regulate buoyancy by regulating the size of the gas bladder, a flexible-walled, gas-filled chamber in the body cavity. This structure is often referred to as the “swim bladder”, but it has nothing to do with generating propulsive forces for the act of swimming and instead saves energy by regulating buoyancy. The gas bladder also is important in hearing by some fishes (see, Hearing). The need to regulate the volume of the gas bladder is aresult of the effect of changing pressure as a fish changes depth. If a fish is neutrally buoyant at a given depth and descends in the water column, the increase in pressure decreases the volume of the gas bladder, making the fish negatively buoyant and the fish begins to sink. If the fish continues to descend, the gas bladder shrinks even more and the fish would have to expend energy to prevent furthers inking. Conversely, if a fish ascends in the water column, the gas bladder expands and the fish becomes positively buoyant. It would now have to either expend energy to swim downward in the water column or continue to float toward the surface with the gas bladder continuing to increase in size as the pressure decreases. Therefore, to save energy fishes must be able to regulate the volume of the gasbladder by the release or addition of gases in order to maintain neutral buoyancy at a variety of depths. The gas bladder is derived as an out pocket from the esophagus, and in some groups retains its connection to the gut via thepneumatic duct (the physostomous condition).In physoclistous fishes, which include the higher teleost`s(Paracanthopterygii and Acanthopterygii), the gas bladder is initially open to the esophagus, but becomes sealed offonce the gas bladder is initially filled during the larval stage.Czesny et al. (2005) showed that larval Yellow Perch(Percidae) that did not inflate their gas bladder fed less efficiently, used more energy, grew more slowly, were more susceptible to predation, and had higher overall mortality than those with properly inflated gas bladders. We will consider function of the teleost gas bladder in two parts – those of gas release and gas addition. Consider first the case of gas release. A fish swimming upward experiences increasing gas bladder volume, and to remain neutrally buoyant the fish must release some of the gas. Inphysostomes, gas can be released directly via the pneumatic duct. In some physostomes, however, such as eels (Anguillidae,Congridae), the pneumatic duct serves as a resorptivearea for slow gas release via the blood, but can release gas rapidly via the esophagus if necessary (Fig. 5.8A). In physoclists,the gas must be released via the blood. 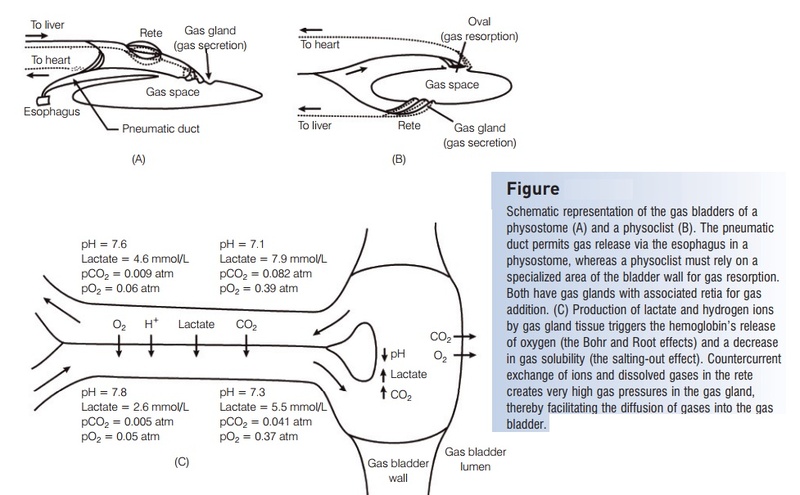 Although most of the wall of the gas bladder is not permeable to gases because it is poorly vascularized and lined with sheets of guanine crystals, there is a modified area (called the oval income species) where gas can diffuse into the blood when the gas bladder expands (Fig. 5.8B). The blood carries the excess gas to the gills where it is released to the surrounding water. Fishes regulate the loss of gas by controlling the flow of blood to the resorption area and by using muscles to regulate the amount of gas entering the resorptive region. Schematic representation of the gas bladders of aphysostome (A) and a physoclist (B). The pneumatic duct permits gas release via the esophagus in aphysostome, whereas a physoclist must rely on a specialized area of the bladder wall for gas resorption. Both have gas glands with associated retia for gas addition. (C) Production of lactate and hydrogen ions by gas gland tissue triggers the hemoglobin’s release of oxygen (the Bohr and Root effects) and a decrease in gas solubility (the salting-out effect). Countercurrentexchange of ions and dissolved gases in the retecreates very high gas pressures in the gas gland, thereby facilitating the diffusion of gases into the gas bladder. (A, B) after Denton (1961); data presented in (C) are for eels (Anguilla), from Kobayashi et al. (1989, 1990). oxygen. The second phenomenon is the reduced solubility of gases in an aqueous solution as the concentration oflactate and hydrogen ions increases (the salting-out effect).This helps to drive the dissolved gases out of solution and into the gas bladder through the formation of small bubbles(Copeland 1969). The combined effect results in the diffusion of gas from the blood and into the gas bladder. Elevated levels of plasma carbon dioxide also enhance the addition of this gas into the gas bladder (Pelster &Scheid 1992). The third phenomenon that makes the gas gland so effective is the efficiency of countercurrent exchange. The blood vessels leading to and from the gas gland are divided into a network of small capillaries that run countercurrent to one another. Such a bundle of capillaries is called a retemirabile (“wonderful net”), or rete for short. As blood leaves the gas gland and travels through the rete, lactate, hydrogen ions, and dissolved gases diffuse down their concentration gradients into the blood coming toward the gas gland. Hence, the countercurrent arrangement of therete capillaries helps build up the levels of diffusible gases in the gas gland. The reason that the blood can give up oxygen in the gangland and enter the rete with a higher partial pressure ofoxygen than it had when it entered the gas gland, is that partial pressure only indicates the amount of gas in solution; oxygen bound to hemoglobin is not in solution and therefore is not accounted for in the partial pressure. So blood leaving the gas gland actually has less total oxygen than when it entered because some of the oxygen has diffused into the gas bladder. However, the partial pressure is higher because the oxygen that is present is in solution. Hemoglobin cannot bind much because the pH is low. One other important factor is the timing of the release of oxygen by hemoglobin under acidic conditions (theRoot-off shift) and the binding of oxygen by hemoglobin when pH increases (the Root-on shift). The Root-off shift occurs nearly instantaneously whereas the Root-on shift takes several seconds. Therefore, hemoglobin in blood inthe rete that is leaving the gas gland area does not increase its affinity or capacity for oxygen until it is already out of the rete. Understanding how the rete mirabile functions to buildup high gas pressures in the gas gland helps explain whyfishes with a long rete can build up higher gas pressures than those with a shorter rete. Deep-sea fishes (see The deep sea), which must deposit gas under high pressure conditions, tend to have a longer rete than shallow water fishes (Alexander 1993). The rete associated with the gas bladder of migratory eels (Anguillidae) lengthens as fish metamorphose from their shallow water, freshwater or estuarine juvenile phase to their deep water, oceanic reproductive phase (Kleckner & Kruger 1981; Yamada et al. 2004). Because the main purpose of the gas bladder is to maintain buoyancy at a given depth, several groups of teleost`sfind it more adaptive to have greatly reduced gas bladders, if they have one at all. Many benthic fishes, such as sculpinsand flounders, either have gas bladders that are greatly reduced in size or lack gas bladders altogether. The absence of a gas float makes it that much easier to remain on the bottom. Fishes that constantly swim and change depth rapidly and frequently, such as some tunas, also lack gas bladders. Herring (Clupeidae) are marine physostomes that lack a gas gland. Their high body lipid content, however, also provides buoyancy, so decreasing gas bladder volume with depth is less of a problem (Brawn 1962). Gas bladders are found only in the bony fishes, so the elasmobranchs must utilize other means to reduce their buoyancy. A cartilaginous skeleton helps because cartilageis much less dense that bone (the specific gravity of cartilageis 1.1, as opposed to 2.0 for bone), and the constant swimming of pelagic sharks helps prevent sinking by providing upward lift. Pelagic elasmobranchs also maintain high levels of low-density lipids in their large livers, which may make up 20–30% of their total body mass(Alexander 1993). Livers of other, more benthic, sharks make up only about 5% of their body mass. The Basking Shark (Cetorhinidae) has a large liver that contains much squalene (specific gravity =0.86), which is less dense than most other fish oils (specific gravities around 0.92). Another low-density, oily compound, wax esters (specific gravity =0.86), has been found in the livers of some benthopelagicsharks (Van Vleet et al. 1984). Some teleost`s also utilize lipids to reduce body density. The skin, muscles, and even the bones of the Oil fish (Gempylidae)contain deposits of lipids, including wax esters(Bone 1972). Wax esters have also been found in the muscles and adipose tissues of coelacanth (Nevenzel et al.1966), and in some mesopelagic lantern fishes (Myctophidae)that lose their gas bladders as adults (Capen 1967).Other tactics to reduce body density include reduced ossification of bone and increased water content of tissues. This is true in the Lumpfish (Cyclopteridae; Davenport &Kjorsvik 1986), a coastal teleost, and in some bathypelagicspecies (Gonostomatidae and Alepocephalidae; Denton& Marshall 1958) (see The deep sea).